This site is a collaborative effort of Russian Blue breeders throughout the United States, Japan, and Europe. Within the site you will find a history of the Russian Blue, answers to questions about the breed, a listing and photos of The Cat Fanciers' Association top Russian Blues, a listing of Russian Blue breeders, and links to other Russian Blue websites and sites with information about cats. Also within this site, you will find articles and photos from the newsletter of The Russian Blue Fanciers, a Cat Fanciers' Association Breed Club. Also included within this portion of the site is the RBF position statement on keeping the Russian Blue blue, photos from recent shows, and their restaurant guide. The Cat Fancier's Association Russian Blue Breed Council site is linked to this site. 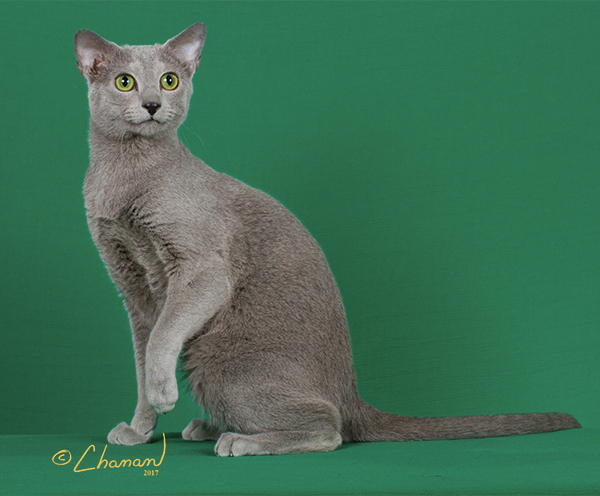 It contains the description of the breed, a listing of current and past National and Regional winning Russian Blues, a listing of recent Grand Champion and Grand Premier Russian Blues, as well as Russians who have achieved the title of Distinguished Merit. We hope that we are able to answer some of your questions about Russian Blues and give you some insight to what CFA Russian Blue breeders are breeding to and showing today. Is there a pedigreed Russian Blue that needs your help? of the individual author or the webmaster.